STRIKER Premieres Video For "Phoenix Lights"
Announces 2017 Tour Dates And New Album! Riding high on the success of their own independent label, Record Breaking Records, STRIKER is the fastest growing metal band out of Canada. 2017 will see the release of their fifth album. More details will be made available soon, but before they are, STRIKER has debuted a new video for the track "Phoenix Lights" from their previous release Stand In The Fire. Watch the video on KNAC.COM right HERE. 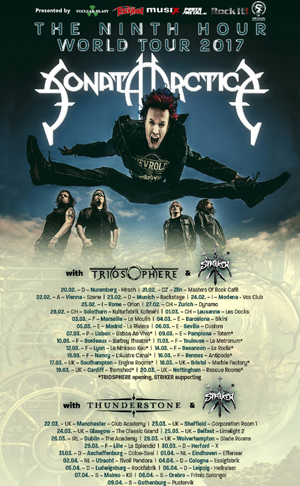 STRIKER will be on tour in the United States from January 15 to February 15 to go with the pre-order campaign for the new album, they will as well as provide direct support for SONATA ARCTICA in Europe from February 20 to April 10, with more tours to be announced shortly. Be sure to check out the new STRIKER Store with all new designs and products HERE.